Incredible issues face Mexico; the wall; immigration; the cartels; the drug wars; the economy; and their relationship with the United States. I am one of the many Americans who love going to Mexico. 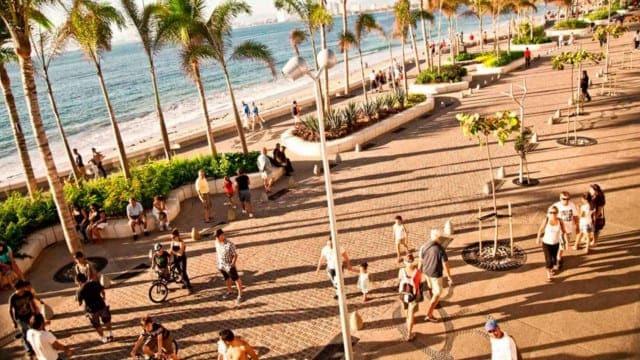 I just returned from Puerto Vallarta, a bustling, safe, tourist friendly town on the Bay of Banderas; where I spent some time talking with Mexican citizens about their views on these and other issues. I made it a point to ask the same questions of everyone, regardless of their economic standing. I spoke with taxi drivers, waiters and waitresses, doctors, housewives, friends and strangers. The responses I received were not what we portray in our news and some responses frankly surprised me. While I was in Mexico, they held their Presidential election. The front runner was Andres Manuel Lopez Obrador, the former Mayor of Mexico City, and a three-time candidate for President. He won resoundingly. In our media, Obrador was said to be a communist leaning candidate, far left, who would not work with President Trump. I asked each person I interviewed why he had such support this time. All but one person I spoke with was thrilled that Obrador won the election. They told me that the news had done everything possible to paint this man as a communist and far left, and they said that they have fake news in Mexico just as we have in America. They feel that Mexico has a huge corruption problem and that this is the man to fix it. Things like water providers were privatized in the past administration, with unchecked price increases and with contracts for utilities going to relatives of those in power. The people want these things to go back to being government controlled to protect them from exorbitant rate increases. The new President promises to review all of these newly privatized contacts, and if they are in order, he will leave them, and if not, he will change them. People were concerned very much with corruption at all levels of government, and are hopeful that their new President will begin the process of removing the corruption. They realize it is a difficult task, but they want a start. They also want to feel safe from the violence occurring due to cartels and drug wars. No one feels safe and Obrador has vowed to take on the drug lords and clean up the crime and the violence. While Mayor of Mexico City, Obrador greatly improved infrastructure and roads, and people are looking forward to more of the same for Mexico. It is their desire to have more jobs in Mexico. They believe that with more jobs and better wages in Mexico, there will be less people going to the United States to work. They all believe, and we have already seen, that Obrador will work with President Trump toward common goals in a businesslike relationship, rather than a contentious one. I asked everyone what they thought of President Trump, and I received no negative responses. To the contrary, people respect that he is doing what he needs to do to protect our country and they respect his business approach to government. They also stress that in their country, they want the same approach, someone to look out for the people of Mexico, rather than their own financial gain. I asked each person what they thought of the WALL. One person said that it wouldn’t do any good, that Mexican people have ingenuity and would tunnel or find other ways. All other respondents did not care if we built a wall or not. It did not insult or bother them. They referred to their own immigration laws and to the people from Nicaragua, Guatemala, Honduras, etc, coming over their southern border. They enforce their borders and do not like the immigrants coming to Mexico illegally, taking jobs and committing crimes. They all agree that the best of them are not who is running over our border in America. They feel we have a right to build the wall if we choose to do so. I spoke to one man from a family of 19 children; three of his brothers came into the US illegally and all three were intercepted at the border and returned to Mexico. He also has two brothers and a sister who came to the US legally, who are each successful, and are now US citizens. He can see firsthand that is the right way to go. I asked about the economy and the unemployment in Puerto Vallarta, and was happy to learn that almost everyone is employed. Wages are low, a housekeeping person in a resort makes about $4.00 a day. Remember that next time, and think about leaving a nice tip for their service! A taxi driver makes $14.00 a day, while in the US they make $16.00 an hour or more. All taxis are private, their fares are regulated and they can use a tip if their service is good. The Mexican people are looking forward to better relations with America. They did not blame President Trump for poor relations, they did blame their current administration and the past two administrations. What they want is for Mexico to reduce corruption, eliminate the cartels, and get their economy reignited, and wages increased. They don’t want to run to America, they love Mexico and just want it to be more prosperous. They are fed up with the past corrupt administrations who did nothing for the people. The thing that always strikes me when I am there is how hard these people work, how family oriented they are, how important their religion is to them, and how happy they seem. With better incomes, their lives would improve so much. We can learn a lot from the Mexicans about hard work, and about service jobs. Nowhere in the world do we receive the service in places such as restaurants and hotels that we receive in Mexico. Serving is an art, and they have mastered it. The doctor still comes to your home and people still go out of their way to help others. That is what I love about Puerto Vallarta. They have the same problems we do, and they know the same commonsense solutions that we do. We are not so different in each wanting our own countries to be a country with borders and rules, without corruption and violence, and they, like we, just want a livable wage, an honest media and government. I, like each person I spoke with, hope the best for Mexico, and hope that President Trump and Andres Manuel Lopez Obrador can build a relationship which will advance the welfare of both countries as we all believe that it is in the best interest of both the United States and Mexico to work together. I still want the wall, and no one in Mexico that I spoke with objected to it. We all want Mexicans to come and work in the US, they need that money, and we need the workers, but it needs to be done in a legal and controlled way. We are neighbors and have much to gain from each other if our leaders can forge a path and a mutually beneficial way forward. Linda Martinelli is the owner and President of Proforma Graphic Printsource,Inc, Co-Owner and CFO of ETCforensic LLC, CFO of Martinelli & Associates. She is a weekly columnist at America Out Loud, and is Host of Talking While Married. Linda is the first sole female franchise owner in Proforma to qualify for the Million Dollar Club and reach Multi-Million Dollar Club status. She was also Proforma’s first female development coach and in 2005, was the first female elected by her business peers to the elite Owners Advisory Council. In 2011, Linda was named one of ASI’s Top 10 Women to Watch and earned Proforma’s inaugural Women’s Leadership Award in 2012.